Ensure that your finished sauces and purees have a smooth texture with this Tablecraft 92 6 1/4" fine tin single mesh strainer! This 6 1/4" round tool is great for straining a variety of clumpy or grainy ingredients so you can serve your guests a finished product with the right consistency. It can even be used for sifting flour and sugar, as well as dusting powdered sugar over cakes. This fine sieve strainer features a single layer of tin mesh for excellent filtration. 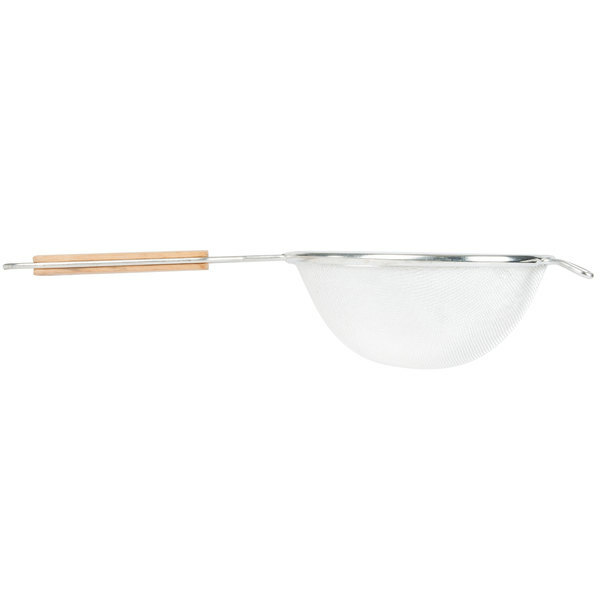 This strainer also has convenient hooks to enable hands-free use while the strainer balances on the pot or pan's rim. 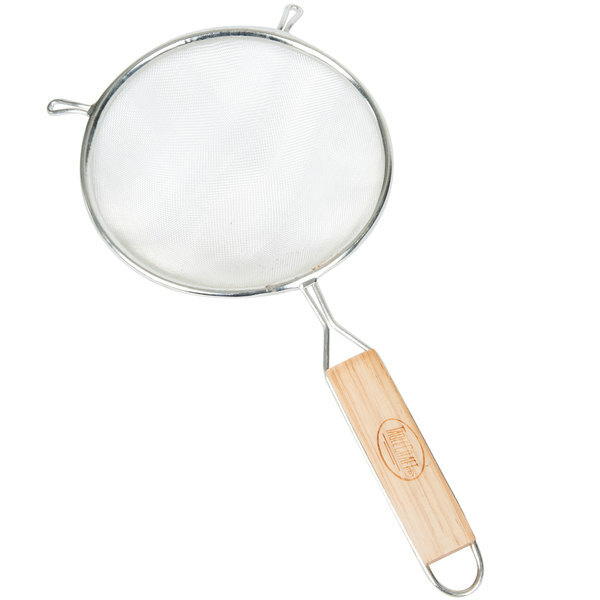 Achieve better texture in your finished foods with the help of this 6 1/4" fine tin single mesh strainer! This is a very nice strainer. I've only used mine with dry ingredients after reading some of the other reviews on here, and I couldn't be happier. It has a nice weight to it, and doesn't feel cheap. It does exactly what it was made for! These work very well, however, i recommend you only use them for sifting flour or other dry tasks. I used it once and it got rusty after i washed it and hung it up to dry. Good quality strainer. Size is perfect for straining and rinsing a large can of beans (14 oz). Very sturdy and excellent quality for the price. This was purchased for dry ingredients as I already have a heavy duty strainer for wet ingredients. Its inexpensive, sturdy and gets the job done. This is an excellent strainer. We found that it took several years of daily use for it to start wearing out. It finally gave out only recently. 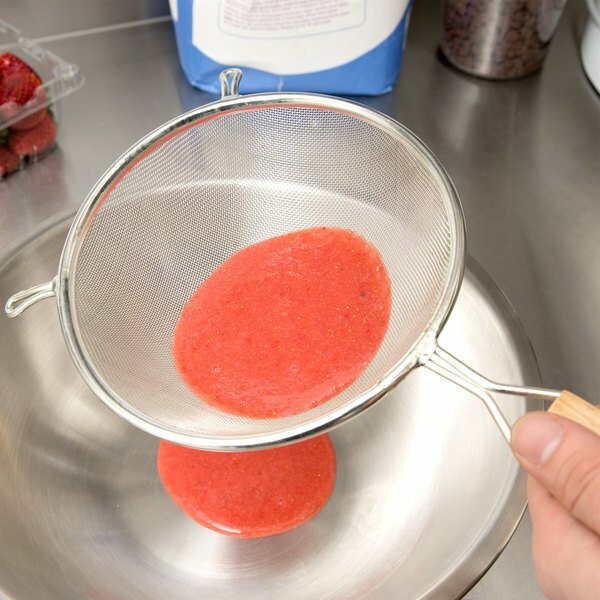 This strainer is a great way to save yourself on lots of messes and spills. It is very easy to clean, doesn't stain, and is very useful! The Tablecraft 6 1/4" Fine Tin Single Mesh Strainer is very durable and versatile. It is great for draining sauces, fruits and vegetables. It is dishwasher safe. The single mesh is perfect for most task. This size is perfect for most jobs. I like to have two of each size so I can use one for cleaner stuff such as tea and dirtier stuff such as oil. This product rusted very badly where the mesh meets the frame. Even trying to hang it to dry quickly didn't help. The health department won't allow towel drying of items so there's really no option for this product. Thank you for your review, Jennifer! We are sorry this Tablecraft strainer has not worked out for you. To avoid rusting, it is best to dry the strainer once it has been hand-washed. Great little strainer, very durable. I hand wash these, and they come clean very easily with hot water. The wooden handle seems to be holding up well so far, but I typically use these lightly (once per week). When I wash these, water tends to collect in the rolled metal around the mesh, so it takes longer to fully dry. This little strainer works great! It gets the job done and does exactly what a strainer should do. We replaced several of these in our kitchen and it's worked out perfectly! The mesh isn't as fine as I had hoped, but I like the hooks so you can rest it on top of a bowl. Not fine enough to sift dry goods, but works for straining sauces, etc. Great quality built strainer that's is much finer than standard strainers, love it for "sifting" powdered sugar for my frostings no more lumps for me. I also like it for dusting flour onto a surface for kneading bread dough. Wash by hand and make sure it gets dry to avoid rust of the mesh. Awesome quality built strainer that's is much finer than standard strainers. I find that its perfect for dusting flour onto a surface for kneading or sifting powdered sugar. This strainer is one good quality product. The mesh is very finely connected making each hole vey small. It is great to strain water from fruits and other small items. I am very satisfied. This is very durable. I use it all the time and never had any problems. I will definitely be buy more in different sizes soon! After realizing that a fine mesh strainer is, oddly enough, probably my most used kitchen tool, I figured I should probably invest in a second one. God forbid the first ever break in the middle of straining a batch of cold press. I use these for EVERYTHING: rinsing dry rice/beans, straining sauces and pastry creams, straining homemade stock, sifting dry baking ingredients, and of course, making my beloved cold press. 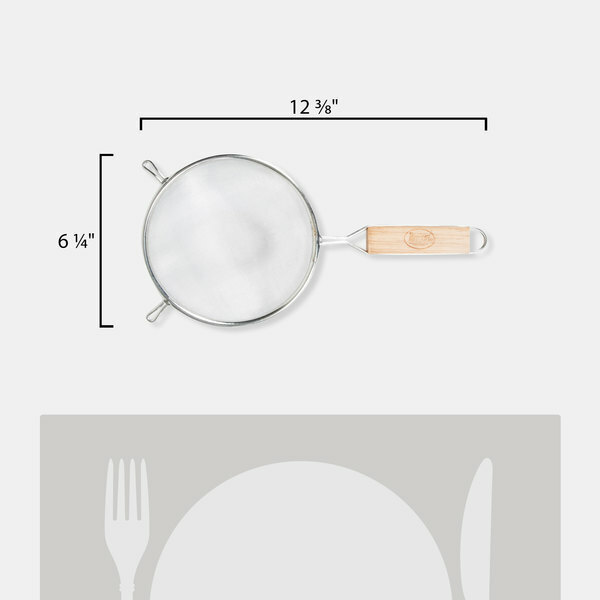 I'm an avid home chef and personal chef so I'm in the kitchen sometimes 4 to 8 hours a day, and this has, so far, held up to heavier than average home use. Note that you should hand wash it because of the wood handle, but I like the look of it better than my rubber-handled one. I reading other reviews and in my case this strainer still in good shape and use everyday with liquids, and hand wash works better, then dry. I like the size its perfect for any preparation. This is a great product. It's a nice size to go over a mixing bowl, and it cleans up easy. I need to buy some more! These strainers work pretty, good except sometimes the quality in the middle isnt as good, as mine started to rip and tear, so i had to order a new one.